Back in Melbourne and back to my man who I missed so, so much. And what did he have waiting for me? A beautiful bouquet of flowers (African sky red and yellow roses!) and an array of Easter chocolates. 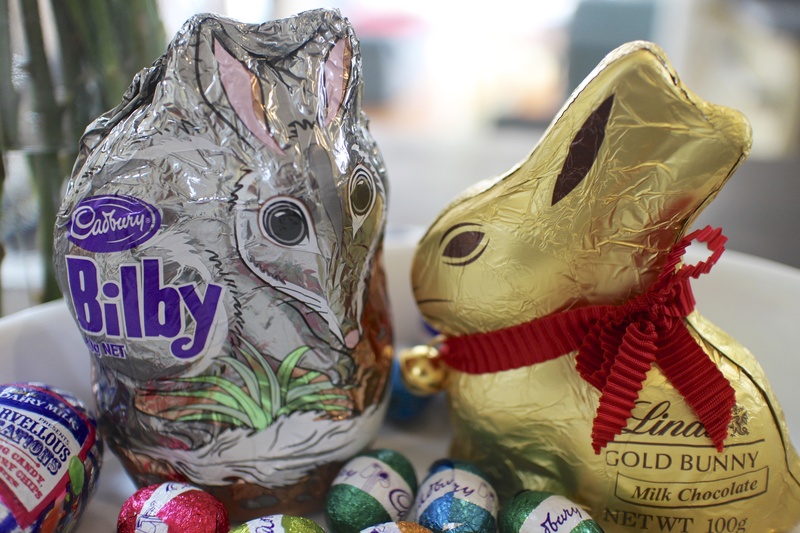 Not only a chocolate bunny, but a chocolate Bilby. Ummmmm…who knew that was even a thing?! From Wikipedia – Bilbies, or rabbit-bandicoots, are desert-dwelling marsupial omnivores; they are members of the order Peramelemorphia. Before European colonisation of Australia, there were two species. The lesser bilby became extinct in the 1950s; the greater bilby survives but remains endangered. So they have a pouch and we have them in chocolate form for Easter down here. Who knew indeed! But I must say, the little guy did taste mighty good. This entry was posted in South Yarra and tagged Australia, Bilby, Chocolate Bilby, Easter, Marsupial, melbourne, WTF. Bookmark the permalink.